In Russia's remote Yakutia region the film industry is booming, despite shooting schedules being restricted by some of the coldest winters on Earth and directors blaming "spirits" for disturbing the production crew. Six time zones away from the country's film schools and without central state funding for its filmmakers, the region nonetheless produces half of all Russian movies made outside the cities of Moscow and Saint Petersburg. "Everybody wants to make movies," said Alexei Romanov, who turned his back on a promising career as a filmmaker in Saint Petersburg three decades ago to return to his native Siberia. "We have films with miniscule budgets and hilariously small fees but they make more in the cinemas here than Hollywood blockbusters," he said. When the director came back to Yakutia, a vast territory that is home to fewer than 1 million people, the local industry consisted of just two cameramen. Now, thanks in part to his efforts, people are "fighting for cameras" to finish their projects before equipment starts failing in winter temperatures that regularly drop to -50 C.
Romanov estimated an average local movie budget to be between $40,000 and $80,000. Most actors basically work for free on skeleton budgets, hoping to eventually get paid from box-office revenues. But domestic and foreign audiences are starting to notice the region's output. Last year, a Yakutian film, The Lord Eagle, about an elderly couple living with an eagle in the forest, received the top prize at the Moscow Film Festival. South Korea's Busan Film Festival, one of the most important in Asia, in 2017 showed a dozen Yakutia productions in a special retrospective, praising their unique cinematic style. Locals jokingly call Yakutia's movie industry "Sakhawood," derived from the region's other name, the Republic of Sakha. Yakutia's unexplored wildernesses steeped in folk legends and shamanic traditions have piqued festival interest, but Sakhawood's genres are surprisingly varied. Recent premieres have included Republic Z, a zombie apocalypse sparked by a virus buried in permafrost. Another new release was Cheeke, a crime comedy about disco dance-offs, with a green-moustached hero. Romanov - one of the founders of Sakhafilm, Yakutia's main production company - said global art-house interest could be explained by Yakutia's mixed culture. "We're Asians on the one hand, and Northerners on the other," combining themes of survival with Turkic heritage, he said. 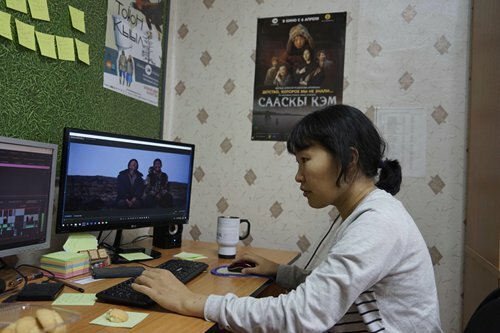 "Sakha cinema combines regional legends and folk religions with contemporary values," Jin Park, a programer for the Busan festival's selection committee, wrote to AFP. Productions show "authentic charm that is rarely found in other regional films," he said. The region's remoteness not only adds to its allure, it has helped keep its independent cinemas alive. 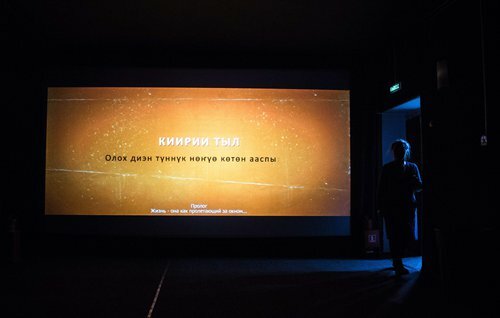 "We are lucky that we are so far away from everything and big distributors never took over our theaters," said filmmaker Lyubov Borisova, as she worked on sound editing of her directorial debut, filmed last summer. "Our isolation makes us unattractive" to large chains, which favor Hollywood blockbusters and shut out locally made films across other Russian regions, she said. Premieres in the region's main city Yakutsk are more community affairs than celebrity galas. People often turn up because a relative was involved in the film's production. At the opening of award-winning The Lord Eagle, guests were treated to pancakes. Discerning local audiences use Instagram now to issue their verdict on films, Borisova laughed. "Our viewers are very capricious, and they know we read all the comments so they address us directly: 'Don't film like that anymore!'" Her movie about a young man sent to work on an isolated island in the Arctic has the working title The Sun Never Sets and will be finished in spring. She said the crew worked on the coast of the Laptev Sea for a month, living in an abandoned wing of a village clinic. The production team constantly heard "spirits" in the building, she added, which they had to ward off by "feeding the fire" - a Yakut tradition of offering small pieces of bread to a furnace. In his youth, Romanov studied under Sergei Gerasimov, a legendary Soviet director after whom Moscow's famous film school is named. "He always told me, don't invent anything, film what you know and don't copy anybody. And that's what we teach our young filmmakers," he said. With that in mind, young directors have found success waiting for them at home in Yakutia.